Learn how to remove the underline from links in Modern Editor. You can remove the underline from all links or specific links. 3. Under ESSENTIALS select General Styles. 5. De-select the U to remove the underline from ALL your links. To hide the link on just ONE link and not globally, adjust the link Styles for one block only. 2. Click on a text block from the preview panel (right side). 3. Click on the STYLES tab from the edit content panel (left side). 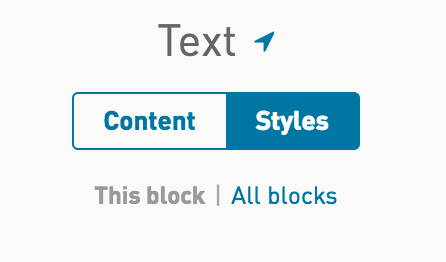 This will be defaulted to 'The block' which means any Style updates here will target this block only. 5. De-select the U to remove the underline from links in just this text block.